Financing Your StartUp Requires Strategic Focus. Adopt A Debt Management Perspective. by adopting a strategic stance on debt management. business in a state of desperation. A debt management perspective will help you to avoid the costly mistakes of start-up mismanagement. The common struggle shared amongst new business owners is financing their business start-up. This is because debt management and budget-balancing are difficult to achieve when both the business and the household are competing for limited financial resources. Thus, smart new business owners do whatever they can to protect their business from dying at the hands of not having enough cash flow to keep the doors of their new business open. You will need to adopt a debt management perspective by strategically planning how you will balance your financial needs with your financial resources. Regardless of the type of business you are launching, you will need at least a little cash to get the ball rolling. So...first things first. You will need to familiarize yourself with the conditions dictated by the I-need-cash-now caveat. You can convince some other party to donate it. Some new business owners decide to fund their start-up by working some type of freelance or lightweight job that gives them flexibility to earn a little side cash while they are working on their business. Other entrepreneurs choose a more creative route by launching their business with a small amount of cash and a big dose of ingenuity by focusing on low cost business launching ideas. Many entrepreneurs dream of funding their start-up with a bank loan. And they make their money by only funding certain types of startups. Each bank runs it's banking business differently. Some banks may only fund those businesses that are tied to real estate, while others may only fund retail businesses. Thus, when shopping for a bank to fund your business, you will have to search for that has a tendency to fund businesses like yours. Many business owners skip the I-need-a-bank-loan dance by using their home's equity to fund their start-up venture. They view this as a strategic way to get access to cash without creating an extra bill. Still other entrepreneurs choose to start their business using credit cards. This gives them quick access to cash without having the hassle of going through their bank. New business owners who use this strategy must use credit cards funds wisely. It is far too easy to run the balance of your credit card up, and then have to make credit card payments on top of your other debts. Some aspiring business owners turn to family and friends to help fund their start-up. This allows them to bypass hassling with bankers and get a financial boost from someone who believes in their dreams. If you are considering using this method, then you will have to learn the abc's of how effectively borrow money from family and friends. Finding Start-Up Cash Through Business Grants. Still other start-ups have elected to find a business grant that would give them enough money to start their business. The US government provides start-up grants for certain types of businesses. Most often these are businesses that are centered on various themes like technology, science, or serving the needs of a particular population. Each grant has it's own specifications and limitations. You will need to check with local SBA office for a current list of government grants in your local area. Choosing A Funding Option - Using a Debt Management Perspective. Each funding option has its own limitation and expectations. Whichever you choose, choose strategically and budget wisely because the goal of debt management is to protect your business from making a financial misstep. You don't want to see your business start-up efforts thwarted because you mismanaged your start-up funds and you can't push your vision forward. Too many times new business owners find themselves over their heads in debt because they did not exercise enough strategic restraint during the start-up phase. The goal of adopting a debt management perspective is to be strategic in how you use financing options. Thus, when choosing a viable financial option, know, up- front, how you will manage both your household and your business with the available funds. Borrowing money for your business, whether from a mortgage finance, a business loan, or a family member means that you will have to somehow earn money to be able to pay back your incurred borrowing expenses. Protect yourself from financial mismanagement by working closely with a financial planning profession or accountant to choose the financing option that is right for you. Don't let financial mismanagement prevent you from achieving your goal. Don't get stuck in a I-need-to-find-money-to-start cycle. You have many options financing your business start-up. Find one or more of these options that will work for you, and utilize it to push your vision forward. If you don't know which is right for you, then contact an accounting professional or financial expert to determine which option will work best for your circumstances. Don't let financial mismanagement keep you from your goal of starting your own business. 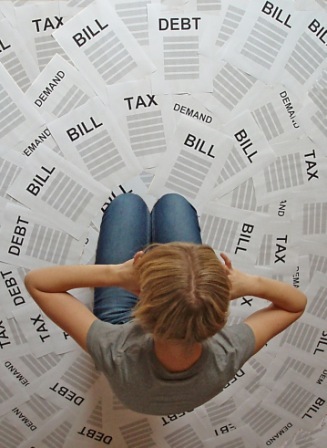 If you are already battling with debt, consider working with a debt consolidation service or a credit counseling service to help you with your debt management goals. Signed: Latarsha Lytle, MBA, your greatest fan and motivational coach. Securing A Biz Loan. Getting a Biz Loan Requires Taking a Strategic Stance and Building a Business Banking Relationship the Will Work in Your Favor. The Danger of Insufficient Cash Flow. Don't Let Insufficient Cash Flow Kill Your Business.